What happened to the clergyman? – For the fainthearted . . .
What happened to the clergyman? 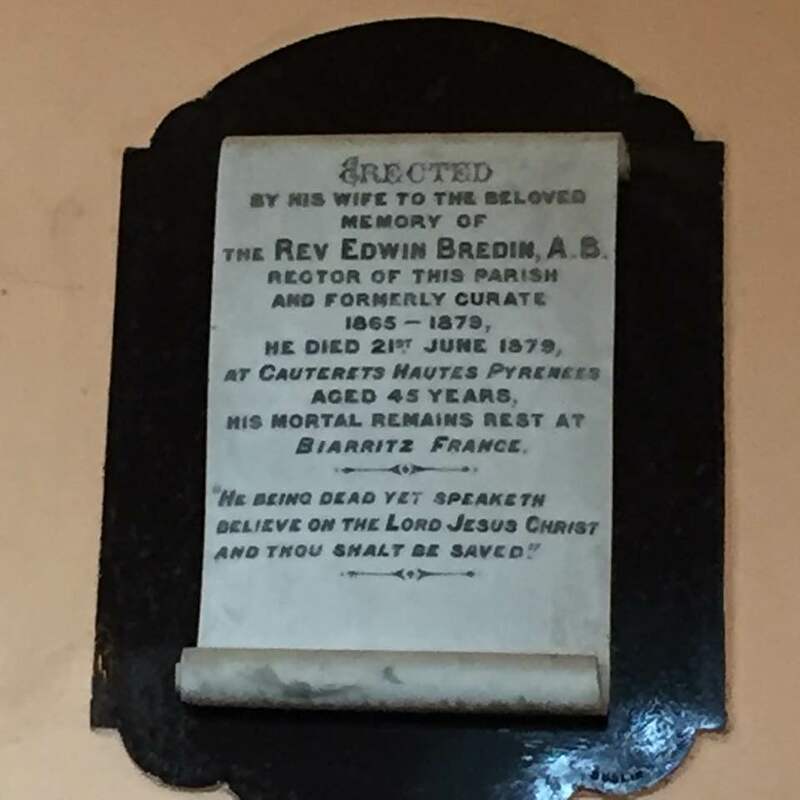 THE REV EDWIN BREDIN A.B. Perhaps there would be some clue as to what happened in”Clergy of Ossory,” a weighty tome providing biographical notes on centuries of clergy. Its entry on Edwin Bredin has a paucity of detail. An Internet search provided little more by way of information. Bredin was not one of those rich clergy who could afford to pay a curate while he himself passed much of the year in the sunshine. The value of the living is recorded as being £115 per annum, not the sort of income that allowed one to be an absentee parson who lived in Biarritz. Born in 1875, in Rathdowney, Ireland, Ethel Mary Bredin was the daughter of the Rev. Edwin Bredin. Upon the death of her father, when she was four years old, Bredin and mother went to live with relations in England. She was educated at St. Leonard’s Ladies’ College, and for one year, at Cheltenham Ladies’ College. In 1904, she married the Rev. Francis Granville Channon, and settled with him at Eton, where he spent most of his working life. They had six children. Channon began to write and published after she was married, for the pleasure of it, and to supplement the family income. She retired, with Rev. Channon, to Bucknell, Shropshire, in 1932, and died there, in 1941. Bredin was obviously not a man of such substantial private means that his wife could continue to live independently after his death, so how did he come to be in the Pyrenees in times when few clergy would have travelled outside of the country? Cauterets is now a spa town and ski station, in Bredin’s time it was at the height of its fame as a spa; Napoleon III and the Empress Eugenie had visited some twenty years prior to his visit. The town had been reached by the railway in 1871 and its hotels had the elegance of the Belle Époque. But what took Bredin there? Had he spent much of his modest income journeying in search of a cure? Had he suffered respiratory illness that might have found relief among the air and waters of the Pyrenees? Why did no-one think to record on the plaque why he had made that last fateful journey? I was looking at the Tithe books for ’27 and it seems the parish was returning somewhere north of £412. It also seems his father held the position before him, and that he was his father’s curate. What’s odd in that area though is there are two parishes like nesting dolls with Rathsaran inside Rathdowney held by a chap named Nixon. What is that data you reference. There’s great chunks missing. And some of the parishes don’t connect to anything. Are some subsets of St Patrick’s, or even the crown. I has a decko at the place in France too. There’s a 19th century neo classical building in the town and it really doesn’t look like anything you’d normally see down thataways. More Swiss really, until you enter the upper town when it reverts to the norm of narrow lanes and pinched turns. And generally on the topic. I was in the graveyard of the Whitechurch near Carrick-on-Suir and found a tomb to Georginia who died in Rome three months after getting married. She was well connected with what might be termed the 2nd rank in the upper reaches of the upperclass in England. My Internet search was brief. A search for “Bredin” and “Rathdowney” brought the details of the value of the living. The area would have suffered significantly in the Famine, so by the post-Disestablishment era the parish was significantly poorer. I thought of Lourdes too, he might have very very High Church leanings. But tiz more likely he was an ill man and was prescribed a visit to benefit from the waters. Would Lourdes have caught on by 1879? time. Perhaps Cauterets was cheaper! he is the natural son of Rev John Dent Fish & Mary Field who married Edwin Bredin after the death of her husband Rev John Dent Fish. Thank you for shedding light on the mystery. Sorry I was unable to shed light on why Rev Edwin Bredin was in Biarritz in the first place. I will see what I can dig up in the months ahead. can’t imagine they would destroy the fine windows?? South Banbury Parish church was deconsecrated in 1967, it seems only to have lasted 120 years. The diocesan office in Oxford could probably point you in the right direction in searching for the stained glass. I also wonder why his step son Lancelot John Fish was drawn to the place apart from the fact that his step father Edwin Bredin was buried there? If his wife remained in Rathdowney, perhaps he travelled in the hope of finding some improvement in a health condition? I think you are right, last desperate effort for relief I think! Henry Francis Lyte, writer of “Abide with me” left Brixham at the end of the summer of 1847 to die in Nice in November that year. Perhaps it was easier to cope with final illness in milder climes. I have a rather poignant photo from the Whitechurch in Co Kilkenny. Where girl got married in summer and by that autumn was dead in Rome. I may have to photograph it again. The girl was the daughter of the CoI rector. ops, it seems I mentioned it above. I just realised i may be making a big assumption that the church would transferred the priest to this chapel, may equally be that the priest paid his own way?? how would he get a post in that region on his own?? After the Church of Ireland ceased to be the Established Church in 1870, appointments to parishes were made by what was called a board of nomination, it comprised of the bishop, four elected clergy and an elected layman to represent the diocese and four laymen elected by the parish. The appointment would have been made by the board and it was obviously the case that both the diocese and the parish were in favour as it was necessary to secure seven of the ten votes.